Thank you for a wonderful, first class experience. The prices are the best we have seen and the customer service were the reasons we bought from MHS. We also received a wonderful and insightful walk-through. Dynamax RVs for Sale at Motor Home Specialist, the #1 Volume Selling Motor Home Dealer in the World. Dynamax sets the bar for the rest of the luxury Super C motor home market. 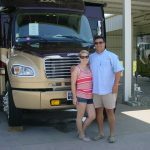 Backed by an industry leading 2-Year limited warranty, the Dynamax company specializes in luxury class C models including Super C Diesel RVs, Class C RVs, and even compact Sprinter diesel RVs. Their current line-up includes some of the most exciting luxury class C units to hit the market place in years. Building off the iconic high-end brand of Isata, Dynamax has just released the all new Isata 3 Series and Isata 5 Series luxury RVs. The Isata 3 is a compact luxury sprinter diesel RV that is sure impress even the most discerning RV buyer. The Isata 5 is an all new product built on the Ram 5500 SLT chassis with HD 6-speed automatic transmission. Both of the new Isata models exceed the industry with Dynamax's legendary exterior paint schemes and still are able to maintain an exceptional price point to the customer when purchased from Motor Home Specialist. They also build the very affordable Dynamax REV. Next in line are the Force and Force HD models. These units share many of the same attributes, but the Force HD features a Cummins 8.9L versus the standard Dynamax Force models 6.7L Cummins diesel engine. The Dynamax Force HD also has 350HP, 1000lb. ft of torque, and an Allison 3200 TRV automatic transmission. Both of these units are available in several different floor plans including bunk model RVs. The Dynamax DX3 has been a war horse in the Super C RV world since its release in 2013. An incredible blend of luxury, power, performance and undeniable value when purchased at MHSRV.com - There is a new model that has also just recently been introduced to the industry. The Dynamax Dynaquest XL. This unit is set to be the flagship model of Dynamax RV for years to come. Built on the massive Freightliner M2 Chassis with 450HP the Dynaquest XL is sure to impress when behind the wheel.You will also find available high end motor home attributes such as tile floors, residential refrigerators and Aqua Hot heating system. Motor Home Specialist is a full line Dynamax RV dealer and always have a great selection of makes, models and floor plans on hand and ready to hit the road! For more details about these incredible luxury RVs please contact a representative today. Thank you for shopping with us at MHSRV.com - We all look forward to hearing from you soon.